Hello friends. Our 2013 company party DJ booking season really heats up around this time! Dates are currently filling up quickly and we are excited to provide top quality entertainment for some of the top companies in the Houston area. 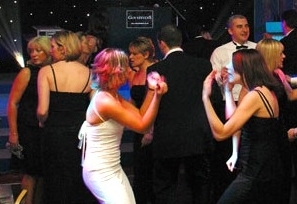 Our philosophy for great company parties is providing a fun, classy, varied music selection. We will normally provide a mixture of Christmas music and background music during dinner, followed by smaller sets of mix genres to give everyone at your party something they like. Chevron, Schlumberger, BP, Shell, 24 Hour Fitness, Exxon Mobile, Landry’s Corp., Grayco Mechanical, Applus, Genica Medical, Houston Zoo, Sysco Foods, Fugro, Conroe Plastics, Employer Flexible, Blackhawk Tools, OAWA, and MANY MANY more. In fact, there are hundreds more as this is a few that quickly come to mind. If you are having a company party DJ, give Xceptional DJ’s a call. We specialize in fun, classy company parties that you and your employees can be proud of. Contact us today!